In the field, seconds count. PHTLS: Prehospital Trauma Life Support teaches and reinforces the principles of rapidly assessing a trauma patient using an orderly approach, immediately treating life-threatening problems as they are identified, and minimizing any delays in initiating transport to an appropriate destination. 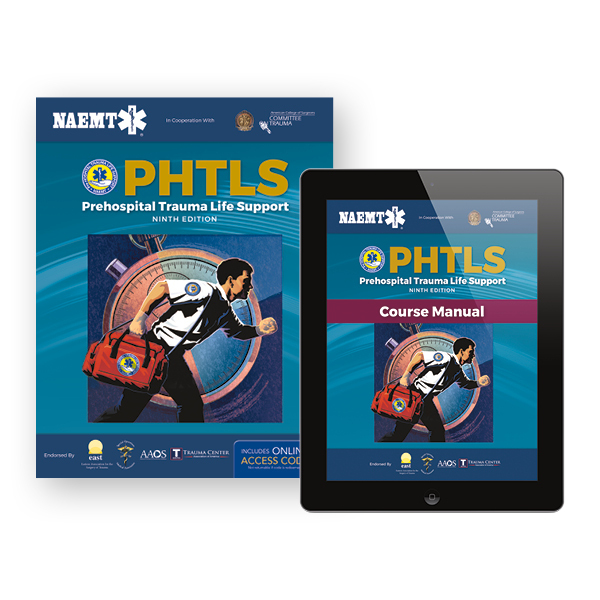 Developed by the National Association of Emergency Medical Technicians (NAEMT) in cooperation with the American College of Surgeons Committee on Trauma (ASC-COT), PHTLS, Ninth Edition reflects current, evidence-based knowledge and practice, and promotes critical-thinking as the foundation for providing quality care. Rapidly assessing a trauma patient to identify life-saving care is at the heart of the ninth edition of PHTLS. It takes 2 minutes or less for a patient to exsanguinate. No other intervention prehospital care providers perform is more important than stopping that level of bleeding in trauma patients. To reflect this, PHTLS, Ninth Edition utilizes the XABCDE patient assessment mnemonic to place exsanguinating hemorrhage at the forefront of every patient encounter. The importance of XABCDE (eXsanguinating hemorrhage, airway, breathing, circulation, disability, and expose/environment) is reinforced in every clinical chapter.